It’s not easy being neutral or blasé about notNeutral’s enviro-friendly and resource-savvy kid’s furniture collection.Their latest sleek offerings are a smart design partnership between notNeutral: Rios Clementi Hale Studios and Loll DESIGNS. Don’t be fooled by the cool, slick surface of these kiddy pieces, though, as notNeutral has created a durable assortment of outdoor furniture made from recycled milk jugs, detergent bottles, margarine tubs, and garbage containers. The pint-sized BBO2 collection offers a whole new spin on ‘putting the garbage out back,’ with kid’s furniture that is designed to turn your backyard or patio into a chic alternative to post-consumer pile up. We love the opportunity to delve into trash talk at Inhabitots, be it a parenting dialogue on cloth vs. disposable diapers, tips for reducing household waste, or simply a bit of sustainable style, trash-to-treasure upcycling. But ‘what’s all the hype about HDPE,’ we asked ourselves when we heard about notNeutral’s latest line of recycled plastics furniture? ‘HDPE’ is an acronym for ‘high density polyethylene,’ a plastic resin used in products and packaging such as milk jugs and the household items listed above. Post-consumer HDPE is a material or finished product has been ‘diverted or recovered’ from waste destined for disposal, after having completed its life as a consumer item. One of the great, investment-rich facts about notNeutral’s BB02 collection (besides its chic design appeal), is the fact that the individual chairs and play tables can be recycled at their life’s end, creating a cradle-to-cradle design loop on household materials and product. 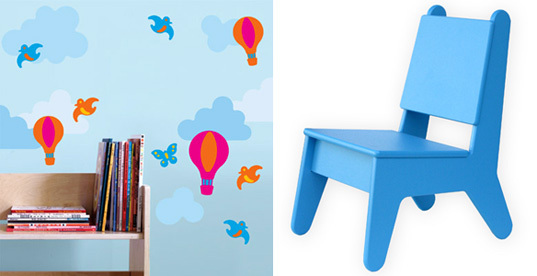 For added graphic snazziness, don’t miss notNeutral’s removable and reusable ‘Season Elements’ wall decals, a super-cute way to add clouds, birds, butterflies and hot air balloons to your child’s bedroom or nursery. 24 decals come in a pack and retail for $40. Made in the U.S.A. Surprisingly hip. I'm not usually into the formed plastic furniture, but these are very sweet looking. 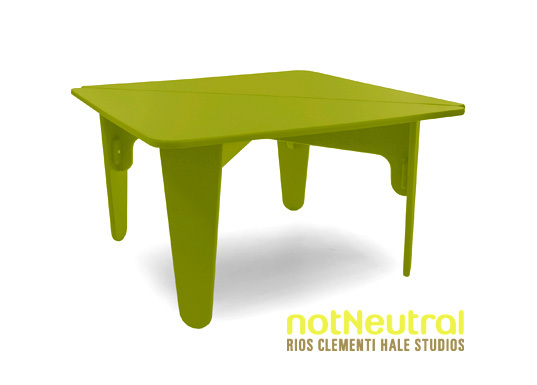 It's not easy being neutral or blas� about notNeutral�s enviro-friendly and resource-savvy kid�s furniture collection.Their latest sleek offerings are a smart design partnership between notNeutral: Rios Clementi Hale Studios and Loll DESIGNS. 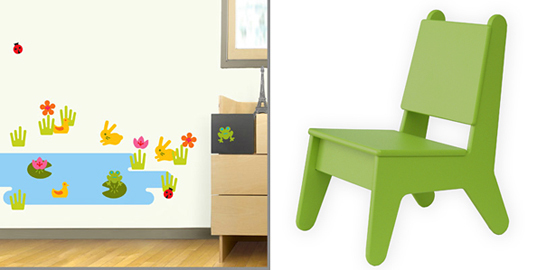 Don�t be fooled by the cool, slick surface of these kiddy pieces, though, as notNeutral has created a durable assortment of outdoor furniture made from recycled milk jugs, detergent bottles, margarine tubs, and garbage containers. The pint-sized BBO2 collection offers a whole new spin on �putting the garbage out back,� with kid�s furniture that is designed to turn your backyard or patio into a chic alternative to post-consumer pile up.